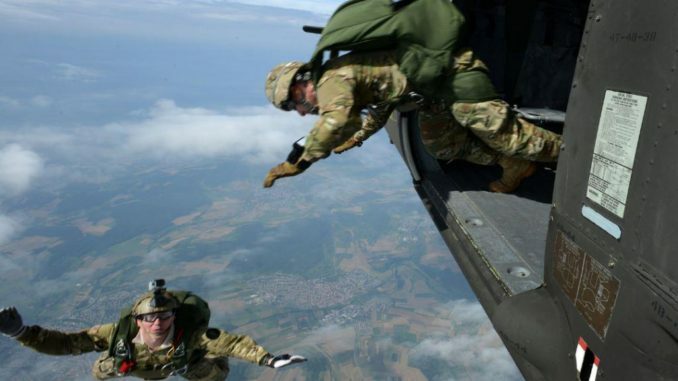 Personnel from Special Operations Command Europe (SOCEUR) perform a high altitude low opening (HALO) parachute jump from a U.S. Army Sikorsky UH-60 Black Hawk helicopter at 12,000 feet in Stuttgart, Germany. (U.S. Army photo by SPC Jason Johnston, 18 Aug 2016). SOF News Update 20170720 – Iraq’s CTS, Taliban have SOF FN SCAR, Australian SAS and war crimes, Wahlberg and Luttrell team up in video, CIA program in Syria halted, SWOWF Golf Tournament, Turkey reveals SF locations in Syria, Australia’s SAS in Afghanistan, female SEAL candidate, and more. Article on Iraq’s CTS – Michael Knights and Alex Mello write up on the history and exploits of the Iraq SOF. They lay out the achievements of the special operations forces of the Iraqi army and provide recommendations for sustaining and employing the force in the future. See “The Best Thing America Built in Iraq: Iraq’s Counter-Terrorism Service and the Long War Against Militancy”, War on the Rocks, July 19, 2017. SOF Locations in Syria Revealed. A Turkish state-run news agency (Anadolu Agency) published a map of 10 locations where U.S. military forces were based in Syria. Read “Turkey reveals secret US military locations in Syria”, The Hill, July 19, 2017. Female SEAL Candidate. A female midshipman in her junior year at the Naval Academy has applied for a spot in the SEAL officer selection process for 2018. She is in the very early steps in the pipeline for special operations assessment and selection. Read more in “Navy Has First Female Applicants for SEAL Officer, Special Boat Units”, Military.com, July 19, 2017. SOWF Golf Tournament. K2 Solutions, Inc. will be hosting the 8th Annual Special Operations Warrior Foundation Golf Tournament. The event will be held on Friday, September 8th, 2017 at the Country Club of North Carolina. Read more in a web site posting by K2 Solutions. Task Force Dagger Recieves Award. USSOCOM has awarded the Patriot Award to the Task Force Dagger Foundation for its support to the command. Read a news release dated March 23, 2017. Video – Taliban w/ SOF FN SCAR. A recent video posted on the Interet shows a Taliban fighter holding a FN SCAR commonly used by U.S. SOF in Afghanistan. See “How Did Taliban Fighters Get Their Hands on US Special Operations Gear”, Task and Purpose, July 18, 2017. Aussie SAS & War Crimes? Not so Much. The Australian SAS recently came under attack by part of the Aussie press corps. But . . . one observer pushes back. Read “Australia’s Special Forces Deserve Respect – Not Cheap Shots“, Small Wars Journal, July 17, 2017. Video on Veterans Benefit. Former-SEAL Marcus Luttrell (Lone Survivor) and actor Mark Wahlberg have joined forces in a 30-second video to spread the word about a new exchange benefit allowing active duty, retired, reserve, and Guard veterans and family members to shop online. Read more in a news report by Task and Purpose, July 18, 2017.